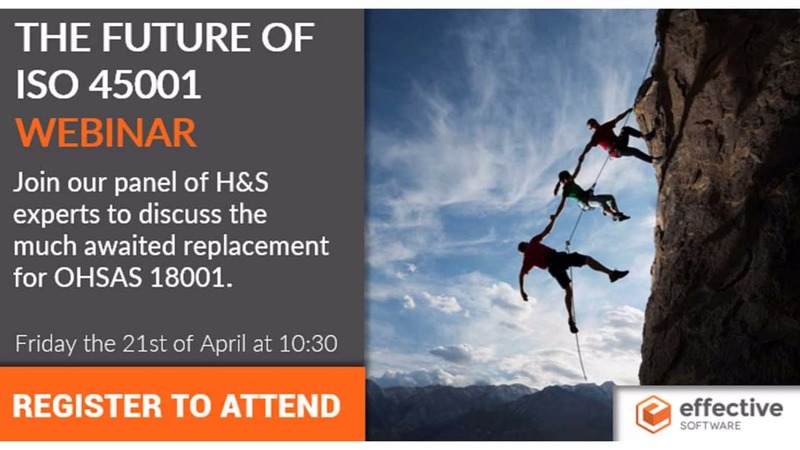 Effective Software will be hosting their “Future of ISO 45001” webinar on Friday the 21st of April at 10:30 GMT. The webinar will last approximately 15-20 minutes and will be presented by Bridget Leathley, freelance Health and Safety consultant, trainer and writer, Chris Ward, a key member of the BSI committee, responsible for OSHAS 180001 and Billy O’Brien, Director of Customer Success for Effective Software and former Health and Safety consultant. An international standard on occupational health and safety is an impossible dream which will never be achieved? WHAT IS THE TRUE MEANING OF CONTEXT? Is it an escape hatch for the tick box organisations? Will certification make us compliant, but not safer? We need different standards for different types of organisations – there is no one size fits all. ARE AUDITS ON THE WAY OUT? Audits are a waste of time and money? Standards should contain only items that can be black and white, not guidance or requirements that require judgement to meet them. If you can’t attend the webinar at this specific date, make sure you register for the recording which will be sent out to you the day following the webinar. Effective Software is recognised as the largest health & safety software provider in the UK & Ireland with clients across many industry sectors. We help organisations with their health and safety processes to minimise risk, promote positive safety culture and prove duty of care. Our hands-on H&S experience enables us to understand your needs and configure our system to your requirements.